For useful information about trees and plants, we invite you to visit our Resources Page. In order to determine whether our islands have the recommended tree canopy to keep our islands healthy, the City and County of Honolulu, Department of Land and Natural Resources - Kaulunani, Smart Trees Pacific, the University of Hawaii and The Outdoor Circle have been conducting a census of trees. The program started with volunteers in Kailua. In June 2016, a group of passionate volunteers began their training to become “certified citizen foresters” (CFs). With the help and support of arborists and mapping specialists, these volunteers learned how to ID trees, gather metrics such as height, canopy spread and diameter and input all of this data into an online GIS software system called "Tree Plotter." Since completion of the training sessions at the end of July 2016, these citizen foresters have met once per week in order to map all of Kailua’s street trees. As of December 2016, they had mapped over 1,300 trees and are quickly approaching their goal of recording data for every street tree in the Kailua. Check Out the Tree Mapping Progress in Kailua for Yourself! ​The accumulated data is available to the general public through an interactive map, where you can see the trees, and their associated metrics, including the calculated environmental and monetary benefits they provide annually. Click here to view the tree plotter map for Kailua. LKOC’s Tree Appreciation Project ~ Thank You Tree Keepers! As more homeowners are building homes that cover more of their land, and paving even more, we are losing the tree canopy scientists say we need to sustain healthy communities. In addition to the shade and oxygen trees provide, they help deaden the noise of crowded streets, cool our roofs and asphalt, and promote a feeling of peace and well-being in our neighborhoods. We have all experienced seeing trees removed and the feeling of loss that brings. It’s possible that if the owners knew the community valued their tree, they might have found a way to work around the tree. If there is a tree you appreciate, please help us let the owners know. We will write the owners a letter letting them know someone asked us to thank them for supporting our community by keeping the tree. You can send us an e-mail by clicking *here* telling us the address of where the tree is. If you can, please include a sentence or two about why you appreciate the tree, and we will pass on those comments. Your nomination will be kept anonymous, and we will determine who the property owner is, and let them know that others appreciate what they are doing to keep Kailua clean, green, and beautiful! 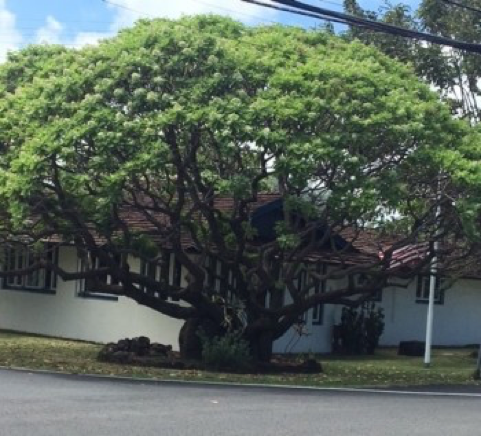 LKOC was instrumental in getting several trees on public property in Kailua ‘exceptionalized”. An Exceptional Tree is one recognized by State of Hawaii as special and deserving of care and protection. These trees contribute greatly to our urban canopy, providing shade, cooling, health benefits, and beauty. The State Exceptional Tree Act (enacted in 1975) was spearheaded by the Outdoor Circle. Four trees in the Central Triangle of Kailua were exceptionalized by LKOC in the 1990’s. These include three Chinese Banyans and a Morton Bay Fig, pictured above. These trees provide a stunning focal point as you enter the Kailua business district. Three spectacular Monkey pod specimens on the grounds of Women’s Community Correctional Center were exceptionalized by LKOC in 2002. These majestic trees, which are clearly visible from Kalaniana’ole Highway, attract visitors and residents alike. In exchange for WCCC's agreement to having them 'exceptionalized', LKOC committed to pay for their pruning and maintenance, as our contribution to our community. Since 2004, LKOC has spent well over $25,000 to date, on their professional trimming every few years. To see a map of all Exceptional Trees in the State, please visit The Outdoor Circle’s interactive Exceptional Tree map. 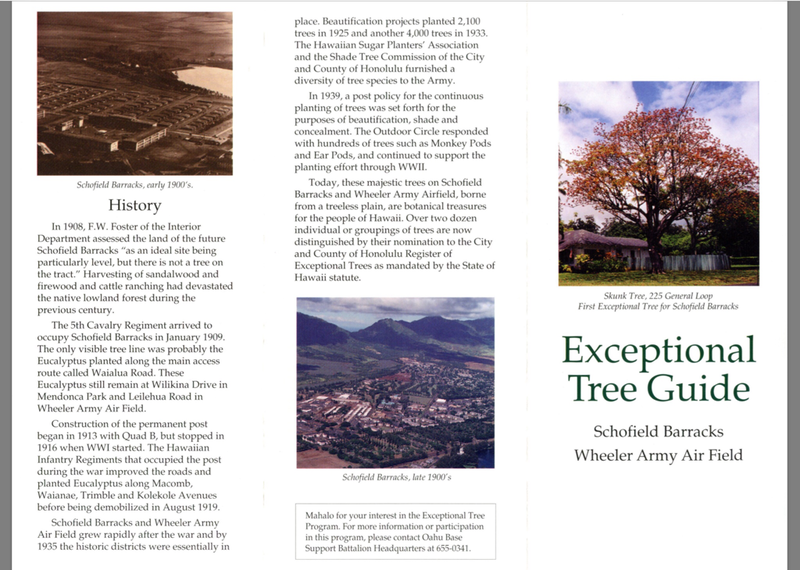 In the fall of 2016, LKOC sponsored a tour of the Exceptional Trees at Schofield Barracks and Wheeler Army Airfield in Waipahu. These facilities are home to the largest collection of Exceptional Trees in the Islands, many of which were planted by the Outdoor Circle back in the 1930's and 40's. Our tour guides were noted arborist Steve Nimz, and the Director of Public Works at the facilities, Patrick Ching. It was a fascinating day, and we are so appreciative of the care these two have taken to preserve these trees, despite the ever growing expansion and renovation going at the bases over the years. Pictured below, our tour group hears about this magnificent monkeypod, with a span of over 80 feet, the first one planted at Schofield. 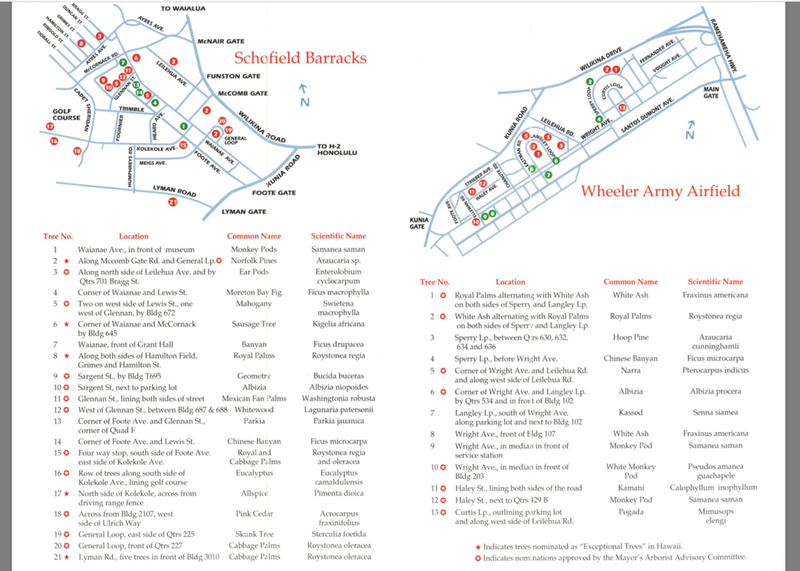 ​Here is an informative brochure showing many of the Exceptional Trees on our tour, with reference to The Outdoor Circle’s contribution to their planting. LKOC has been involved in numerous tree planting projects over the years. Please visit our LKOC Projects and History of LKOC pages to see examples of our work. Below is a project we spearheaded on Mokapu Boulevard. In 2007, in partnership with the City and County of Honolulu, Lani-Kailua Outdoor Circle took on the project of replanting the median on Mokapu between Kalaheo Avenue and Marine Corp Base Hawaii. (Mokapu from Kalaheo Avenue to Oneawa is a state road.) The median had been planted with wiliwili trees, but those beautiful trees were devastated by the gall wasp introduced to Hawaii. LKOC funded the trees (over $15,000), and C&C donated use of their equipment and manpower to plant the trees. Now, shower trees adorn both ends of the planting, and narra trees fill the center sections. We look forward to driving in the shade of these trees as they grow and fill out to create a canopy where the wiliwili trees once stood. How is the Outdoor Circle Involved in Maintaining our Urban Tree Canopy? The Outdoor Circle is not the only organization that plants trees. But just putting a tree in the ground doesn’t reforest anything. Maintaining our forests, urban and rural, as a healthy environment, takes years of attention. The Outdoor Circle didn’t just exist for over 100 years, we were involved with our community in ways that have impacted Hawaii for good that would not have been done by any other organizations, however wonderful they are. We follow up for decades, advocating for trees and the benefits they contribute. Our organization and its many branches care for forests, planted areas, open areas—all the way down to individual trees: tree by tree, area by area, island by island. When a tree is sickly or butchered, we work for the health of that tree. When a tree is in danger of being removed, we work to keep it. Because the public is not as knowledgeable about trees and who to turn to in order to protect them, we have been given a mandate from them to protect trees and green spaces. Members of the public expect us to keep Hawaii beautiful and fault the Outdoor Circle publicly if standards are not met. This kind of advocacy requires a great expenditure of time and knowledge. Experience shows there is background that needs to be understood for every incidence. Is the tree a responsibility of the state or the county? Does it come under Department of Transportation or Parks and Recreation? Is work being done by a government crew or a contractor? Who is the certified arborist overseeing the work? Who determines whether or not a tree might create a danger? And, we make sure all this knowledge is at hand, 24 hours a day, because the crew is maiming or removing the tree as we go through this maze of information. We’ve done such a good job, that much of the public takes it for granted that we will be there. For those that are interested, here is a link to a description of the history of Arbor Day in Hawaii. Note that past LKOC Beautification Committee Chair, Cindy Turner, spearheaded the Annual Arbor Day tree give-away on Oahu in 1993, which continues to this day.